While several Stateside seminaries have reported upticks in enrollment over the last decade, the largest of the bunch remains across the Atlantic... and as the trend has only served to bolster the Pontifical North American College's standing as the lodestar of priestly formation (and a good bit else) back home, this Monday brings the accordingly consequential word of a change at its helm. For purposes of context, it's no stretch to say that when the NAC sneezes, the US church catches a cold... and, indeed, a good chunk of global Catholicism starts sniffling, to boot. Even beyond its current 250-plus seminarians – a high over recent decades – the reach of "The Hill" is even more tellingly explained in the students' presence from nearly 100 dioceses, comprising a majority of the nation's Latin-church outposts, as well as a handful each from Australia and Canada. (An additional 75 priests in graduate studies live at the college's Casa Santa Maria, the NAC's original home in the city's core until the Gianicolo compound opened in 1953.) Yet whether they come as theologians preparing for ordination or advanced degrees afterward, its alums have formed the modern backbone of American hierarchical leadership: today, no less than two-thirds of the nine Stateside cardinal-electors – including three of the four who lead dioceses – are products of the college and/or the Casa, along with a heavy plurality of the nation's bishops and a wider network that leaves practically no church entity on these shores untouched. Borrowing from another field, it's a profession-wide impact comparable to having the graduate pools of Harvard Law and Yale Law rolled into one. Six months since just the latest Papal Mass in the NAC's chapel, it still bears repeating that the Hill's dominance stretches across ecclesiological lines: the most diametrically differing figures of the home-crop's top rank as it stands – Cardinal Raymond Burke, now patron of the Order of Malta, and Archbishop Blase Cupich of Chicago – are both members of the NAC Class of 1975, as are at least six other US bishops. And all around, given its legacy of leadership from the sweep of its hilltop campus in sight of St Peter's – newly anchored by an $8 million, 10-story tower (left) opened in January – the college's role as Rome's unquestioned hub of American Catholic life gives its rector an outsize influence not just on the next generation of shepherds he forms, but the current one which calls the place home whenever they're in town. Lest anyone forgot the principal proof of it, the hospitality and charisma of the 20th Rector created a cult following that, within a decade of his departure from the Hill, would catapult Tim Dolan into the archbishopric of New York... and when Dolan went on to write his own history in becoming the first Big Apple prelate ever elected to lead the national bench, the deciding votes came from the younger appointees whose own priesthoods were marked by the book of conferences he gave his NAC seminarians. Back to the latest of the line, Harman's appointment to the Rector's Office comes as a surprise given both his background and place in the college's pecking order. In marked contrast to his predecessors who were elevated from within, the new chief isn't the incumbent vice-rector on the Gianicolo, nor anywhere close – indeed, the formal listing ranks his current post ninth among the faculty. As for biography, while being an alum of the seminary, Harman didn't return to Rome for later studies but instead rose rapidly in his home diocese, becoming rector of Springfield's Cathedral of the Immaculate Conception (and guiding the end of its $11 million, stem-to-stern restoration) within a decade of his ordination in 1999. His undergrad work done at St Meinrad, Harman's doctorate in theology comes from the Catholic University of America in Washington, with a dissertation on St John Paul II's enrichment of a "theology of suffering." 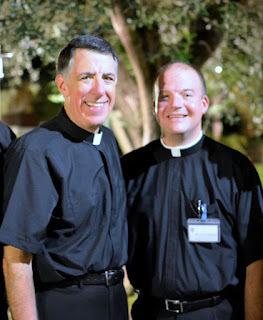 Only in 2013 was the now-incoming Rector called back to Rome to oversee the NAC's program which forms its priests-to-be in preaching, celebrating the sacraments, and works of charity. In addition, he's served as the college's media liaison. Developing – more to come.